Karina's Kreations: Fancy Fold Seasonal Bells Card! Fancy Fold Seasonal Bells Card! Winter is officially here in Edmonton. I'm looking out my window to see the roads and ground covered in snow!!! I think a Christmas card is perfect to share today. This card is made using the Seasonal Bells stamp set. I love the Christmas greetings in this set and the wedding greetings. I also love that this stamp set has a coordinating bell punch. 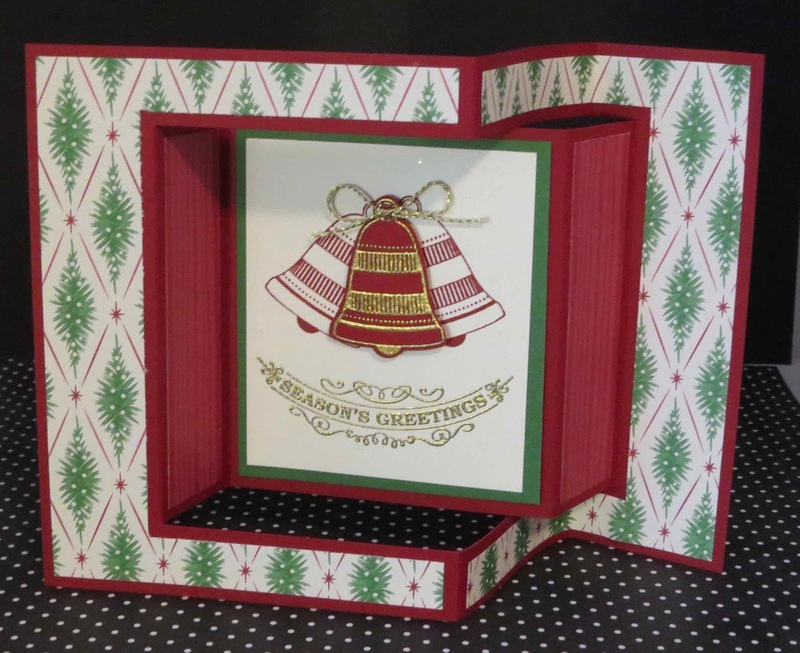 This fancy fold card was part of my stamp set of the month program. It's $30.95 and you get three hand stamped cards and the instructions to make the cards. I'm going to teach my friends at the Wednesday morning card class how to make this fun type of card. Email me at kchin2@telus.net to attend the class or signup for stamp set of the month.